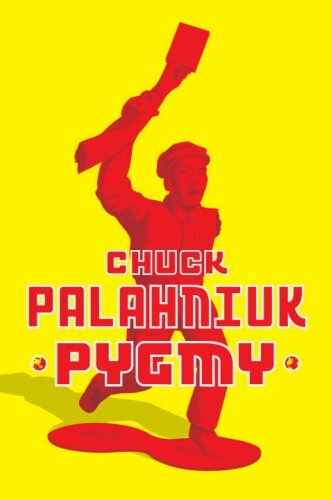 I’ve recently finished “Pygmy” by Chuck Palahniuk. …all this good work was threatened by “Pygmy”, which was released late last year. I’d picked it up and turned it over, had a quick flick, and put it back on the shelf awaiting richer days. Last week, however, this red-and-gold clad number fell into my hands for reviewing for Yartz. I have to say, I really came out of this one confused. “Pygmy” reads in a much less coherent way than Palahniuk’s other novels. The narrator is from an unnamed totalitarian country, and goes to America in the guise of an “exchange student” in order to infiltrate and put into action “Operation Havoc”. He tells the story in thoroughly broken English, absolutely free of any kinds of grammar or syntactical rules. It took a while to get into, but like any incredibly stylized voice, eventually I got there. This is not what made “Pygmy” such a disappointment. The lack of coherence here came from the fact that none of the chapters in the book really fit together comfortably. It’s reads less like the tumbling-down-stairs-at-an-alarming-rate stories that I’ve come to expect from Palahniuk, and more like an assorted collection of the most horrible episodes he could think to put in a novel. Granted, this book is uproariously funny. Hilarious. It’s just a pity that’s the most I got out of it. All the horribleness does have a function though. This is an amusing but incredibly biting satire of American life and the terrible potential of the wrong people having power. Usually with Palahniuk’s novels, I dive in and get comfy, and leave feeling like I’ve gotten away with something a little bit cheeky. Not so with Pygmy. I enjoyed reading it, found it characteristically hilarious, but Palahniuk has written much better novels and has missed the mark a bit with this one. I’d agree that this one wasn’t his strongest, and I guess it was a bit of a step down after the brilliance of ‘Snuff’, Although the pidgen English narrative voice didn’t piss me off as much as I first thought it might, I was hoping we’d get to see Chuck do something more inventive with it, like having the protagonist gradually shifting into a fully Westernised style over the course of the chapters, paralleling the insidious influence of Western Culture on Pygmy. Then again, I find that even Palahniuk’s ‘weaker’ novels are still so rich in ideas and texture that I’m never really, truly disappointed, and I always feel like I’ve gotten something rewarding out of reading them. Pygmy’s speech did get a little more Westernised, as when Pygmy continues to recite the elements in his head and starts including things like “Zoloft” and “Xanax” in the list. I didn’t find it entirely disappointing… I laughed a lot, and I won’t say I got nothing out of it, I just found many stumbling points along the way. I guess he just set the bar so very high with the likes of ‘Fight Club’ and ‘Choke’. We’re probably just being far too demanding expecting another tour de force of that kind of magnitude every time. If I could write a novel that was half as good as Palahniuk’s worst, I’d be a happy scribe indeed. I “read” this in the form of an audiobook which, I suppose, makes it a lot easier to get through the broken grammar because the person reading it out already has to do an interpretation to be able to read it…. I thought both the quality of the reading and the book was exceptional, I liked them very much. Don’t know how tiring I would’ve found it, had I to read it to myself though. Oh, and English is only my second language and I still had no problem getting into the story. The good reading did it, I guess.